Despite the Falling Snow – Shamim Sarif – Book Review by Patrick V.
John Blake Publishing has issued a new edition of Shamim Sarif’s 2004 novel, Despite the Falling Snow, prior to the release next month of a film based on the book, starring Charles Dance and Rebecca Ferguson. This is the third of Sarif’s works to be adapted to film. Her first prize-winning novel, The World Unseen, the story of two women who engage in a dangerous relationship during South Africa’s apartheid era, was made into a film in 2007 starring Lisa Ray and Sheetal Sheth. The same two women also starred in a 2008 adaptation of Sarif’s second book, I Can’t Think Straight. With chapters alternating between the United States in 1998 and the Soviet Union in the late 1950s, Despite the Falling Snow tells the story of Alexander (Sacha) Ivanov, a Russian émigré who has settled in the States after an early career in the higher echelons of the civil service in Khrushchev’s USSR. For much of the novel we are not told how or why he has come to be in America and the unweaving of the strands of this journey adds to the tension of the story. The book begins in Boston with Alexander, now almost 70 and on the point of retirement, negotiating the sale of his very successful catering business to a young career woman, Melissa Johnson. While waiting for the finer points of the deal to be sorted, he meets Estelle, Melissa’s mother, and a tentative friendship develops between them. Their conversation triggers a series of memories for him and the story moves to Moscow in 1956 where Alexander met and fell in love with Katya, a young woman whose parents had been victims of Stalin’s brutal regime. His relationship with Katya forms the heart of the book. From the start we are told that she died soon after their marriage and that Alexander feels responsible for her death but it is not till the final chapters that we learn the full facts of their life together and of the external pressures that shaped their fate. The espionage and betrayal that undermine their lives, however, lacks the gritty authenticity of a John Le Carré or a Len Deighton. Sarif’s interest lies more in the emotional life of her characters. The loss of Katya and his feelings of guilt have left Alexander unable to form other attachments and it is only through the intervention of his niece, Lauren, who is determined to find out the full truth of Katya’s fate that he is able to move forward. Apart from the circumstances of Katya’s death, however, there are not many surprises in this story. There is a certain predictability to many strands of the story and the detailed description of meals prepared and décor distract from the plot. A good editor could certainly have pruned 50 or 60 pages from the novel without it suffering in any way. The sub-plot of a lesbian relationship, for example, seems imposed on the story rather than growing intrinsically from it. 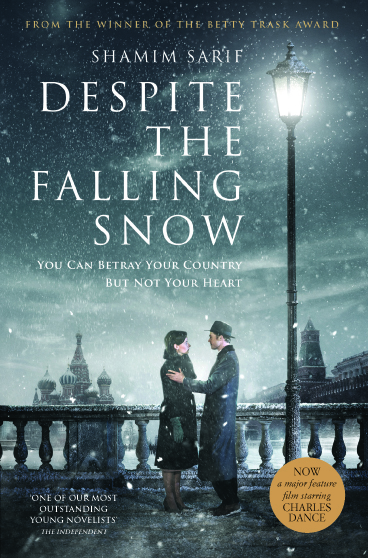 Despite the Falling Snow may not succeed totally in all it promises but it is a moving and colourful retelling of a doomed, intense love affair at a troubled period of Soviet history and its effects on all those touched by it.